A couple of times a year, I descend toward the heart of Class Charlie airspace surrounding the Greater Rochester International Airport for some practice with the control tower there. I do this to keep my ear proficient because I do not routinely fly into towered airports. As a student trained at a non-towered field, my early interactions with air traffic control (ATC) were awkward at best (e.g., “Mishaps at Muskegon”). Learning from that experience, I worked to improve my comfort level with ATC once I became an aircraft owner. In my opinion, it pays to exercise that ATC fluency from time to time. While climbing away from a lunch stop at the Dansville airport, I decided that I was due for some practice and made an initial call to Rochester approach to get their attention. “Warrior 21481, go ahead,” responded the approach controller. ”Warrior 21481 is 20 miles south at three thousand, inbound for touch and goes with echo.” For the uninitiated, a “touch and go” is a landing with a short roll followed by an immediate departure. I had no desire to drive around the surface of Greater Rochester International; the point was to fly in and work with the tower. "Warrior 481, squawk 0333 and ident.” I dialed the code into my transponder and pressed the "ident" button that would momentarily brighten my aircraft on the controller's screen. At the moment, Rochester was moderately busy and the approach controller was working a combination of airliners, private jets, and single engine general aviation aircraft like mine. “Warrior 481, radar contact one eight miles south of Rochester. Turn right heading 040, vector for runway two five.” Runway 25 is Rochester’s dedicated general aviation runway. Instrument traffic, including everything from single engine piston aircraft to commercial airliners, was using runway 22 that day. I turned on course and listened to the chatter between ATC and other aircraft converging on the airport. Once I was within ten miles of Rochester, I could clearly see the airport as a snow-covered field. Due to their orientation, the runways were invisible from my position, but I could see the control tower standing tall on the south edge of the field. Shortly thereafter, Rochester approach called again. I switched to the other radio, already set for Rochester’s tower frequency. Protocol is to “check in” on the new frequency. In this instance, simply calling with my tail number should have been adequate. The approach controller should have communicated my intentions to the tower controller already. I expected the tower to respond with a clarifying question or a directive to continue on left base leg for runway 25. “Warrior 481, clear to land runway two five.” I was at least eight miles out. I acknowledged the landing clearance, but something seemed wrong. Then I realized that the tower should have cleared me for a touch and go, not a landing. Did the tower controller not have information from the approach controller or had he simply made a slip of the tongue? “Clear to land, two five, Warrior 481.” I began to ponder what I would do once earthbound at Rochester. Taxiing around the airport was not part of the plan. 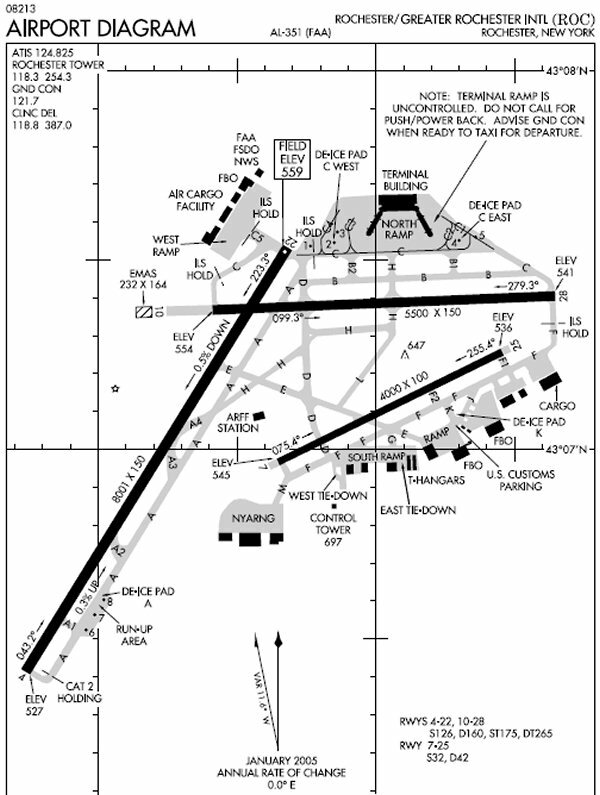 Do I even have a taxiway diagram with me? I didn't know. Poor planning on my part, perhaps, but a diagram would not have been necessary for merely rubbing my tires on one of Rochester's runways a few times. “Affirmative, Warrior 481,” I answered. “Warrior 481, you are clear to land runway two five. Hold on the runway.” I repeated the clearance, half wondering if I heard it correctly. When the controller did not correct me, I realized that it was for real. He wanted me to land on runway 25 and just sit there, counter to every instinct I would have telling me to clear the runway as soon as possible. On final approach, I took stock of the situation. Another Cherokee taxied to the departure end of runway 25 and behind it was a Cessna 400 (nee Columbia) . Across the airport, an airliner in Delta livery was plodding along a taxiway en route to the commercial terminal. I could also see a Cessna across the airport on final approach for runway 22 with full flaps deployed. From my time on the approach frequency, I knew that several other jet aircraft were inbound, but none had switched to the tower frequency yet. Sounding flustered, the tower controller replied, “uh, negative Cessna 123. You are clear to land two two. Did you want a touch and go?” Clearly, there was a communication breakdown between the approach and tower controllers at Rochester that afternoon. I floated low over the runway numbers and as the stall warning horn began to sound, I rolled the Warrior’s wheels onto the runway in one of the softest landings I had made in a long time. I pulled the yoke back to my chest and waited for the nosegear to contact the runway before pressing the brakes. I brought the Warrior to a full stop in the middle of the runway, about one third of the way down. From my location on runway 25, I could look to my left and see the control tower. Don’t forget about me, I thought at the tinted windows surrounding the tower cab. I sat there, idling, feeling very vulnerable. I have read a few accident reports involving ATC mistakenly clearing aircraft to land or depart a runway already occupied by another airplane. For this reason, it is generally good practice to exit a runway as soon as possible after landing. This is particularly true at the non-towered airports I usually frequent. From the activity on frequency, it was obvious that the controller was waiting for an opportune lull in jet traffic on runway 22 that would allow me to launch without posing a conflict. I do not know how long I waited in the middle of that runway, intently listening for the controller to slip up and clear someone to land or depart runway 25 while I still occupied it. My hand rested on the throttle and my eyes focused on a nearby taxiway – my closest escape if any mistakes were made. My discomfort slowed the progress of time. Eventually, like a golden sunbeam puncturing an iron gray overcast, I finally heard the tower controller utter my tail number. “Warrior 481, cleared to depart runway two five, make left traffic.” I think I actually heard angels singing in the background. As I advanced the throttle, I could feel that my shoulders had tightened during the tense wait. I was climbing skyward, freed from a vulnerable position on the runway, and could feel the knots in my shoulders loosening. From the traffic pattern, I watched the Cherokee that had been holding behind me depart runway 25. I made three touch and go landings on runway 25 that afternoon and my airmanship was excellent; patterns were well-flown and landings were greasers. Just prior to the third landing, I told the tower that I was ready to return home to Le Roy. Turn right? I glanced at the GPS and verified a suspicion that flying runway heading would take me directly home; no turns required. Because he did not dictate a heading, I acknowledged “on course, Le Roy, Warrior 481” and continued on runway heading. Within the next couple of minutes I was switched back to the departure frequency, given a new transponder code, and shown the way out of Class Charlie airspace by the same controller that had guided me in. Upon reaching Le Roy, the departure controller wished me a good day, advised that no traffic was observed in the vicinity of the airport, and released me from the system. I brought the Warrior back to earth on a runway covered with an inch of snow. I waited for the bump that signified contact of the main gear with the pavement, but it never came. One moment I was floating over the runway and the next, I was rolling. I decided that I liked having an inch of snow on the runway. It was like landing on a pillow. As always, the exercise of flying into Rochester was time well spent. It certainly underscored the necessity to pay close attention (this goes without saying) and double check confusing clearances rather than trying to divine what the controller may or may not have meant. But more importantly, the episode served as a reminder that the control tower is not Mount Olympus and its inhabitants are not deities, but human beings that can make mistakes. This is not an indictment of Rochester ATC; the folks at Rochester work hard and, in my admittedly limited experience, have always been extremely helpful and professional. The point is that while both pilots and controllers are capable of mistakes; the system still works well as long as we have patience and watch out for one another. With the ambient air at thirty-three degrees Fahrenheit, a thin blanket of melting snow began to retreat, revealing runway asphalt beneath. A fortuitous break in the weather provided opportunity to launch from Le Roy on a brief ferry flight to nearby Batavia for maintenance. Since installing an engine analyzer in N21481 a few months previous, I was concerned that my #3 cylinder routinely ran hot, easily recording cylinder head temperatures (CHT) at the 400°F mark that most experts cite as unhealthy. I pushed the throttle full forward and Warrior 481 trundled along the wet runway. As the airplane climbed into the cool air, I noticed some runway slush spattered on the leading edge of the wing. I continued to climb away from Le Roy on runway heading. As I reached 1500 feet, I noticed that the #3 cylinder already registered 400°F. I pushed the nose forward to improve the flow of cooling air over the engine. For an overcast day, it was surprisingly turbulent. At 2000 feet, I corrected for a couple of significant bumps when I felt a loss of power. The airplane suddenly bucked and the engine sputtered. I saw the tachometer drop to 2000 RPM and I pulled the carburetor heat lever without really even thinking about it. That is what training in a carburetor icing-prone Cessna 150 will do for you. Not that I seriously believed carburetor icing to be the culprit - Cherokees are notoriously resistant to carburetor icing and I never experienced it during five years of all-season flying in Warrior 481. The engine continued to run rough and I saw the exhaust temperature on cylinder #3 suddenly spike. This is it, I thought. I ran that cylinder too hot too long and now I'm losing it. I brought the throttle back to idle to get the cylinder temperatures down and wheeled the airplane into a 180° turn back to the Le Roy airport. Trimmed for a 74 knot best glide speed, I announced an emergency landing and easily managed to glide through the pattern and land; my first precautionary landing in eight years of flying. I advanced the throttle slightly to taxi clear of the runway and switched the carburetor heating off. Once I found a dry parcel of taxiway, I locked the brakes and ran the engine up to full power. RPM came up as it normally does and the engine analyzer showed all cylinder temperatures rising evenly. Confounded, I swept my gaze across an instrument panel displaying nothing but nominal readings. It was as though the airplane was saying, "why so uptight? Everything's normal here." Carburetor icing is the only explanation. Conditions must have been just right; air temperatures near freezing with lots of moisture soaking the air above the thawing runway. But I will never really know for sure. The problem with carburetor icing is that all evidence of the problem literally melts away. I experienced carburetor icing several times in a Cessna 150, most notably on the day of my first solo and the day I took my mother for her first airplane ride. But those were benign events compared to the convulsions my Warrior's Lycoming O-320 experienced that day. In fact, the instance with my mother was so mild that I remedied the situation without her ever realizing anything was amiss. My heart rate settled a bit as I came to accept that my first real emergency…wasn't. Fortunately, the constant threat of carburetor icing during my student pilot days made application of carburetor heat automatic at the slightest hint of power loss. Had I not used the carburetor heat, ice may have completely choked off the flow of air and fuel to the engine and I would have had a real emergency on my hands. I taxied to the departure end of the runway and performed another flawless full power run-up. Satisfied, I departed the wet runway a second time and circled the airport. The engine ran normally and, once I was certain that it would continue to do so, I flew to Batavia. After some time spent with my mechanic, we repaired the loose metal baffle between cylinders #1 and #3 and improved the sealing of some of the other baffles. My engine was free of typical visual indicators of damaging heat and my mechanic surmised that, though cylinder #3 had been running hot, it had probably not been so hot as to cause any catastrophic problems. Nevertheless, I was delighted to see all four cylinder head temperatures within three degrees of each other as I climbed away from Batavia that afternoon. It was time well spent: I fixed my airplane AND joined the somewhat select ranks of pilots to experience carburetor icing in a Cherokee.